High above the world, on the frigid slopes of Mount Everest, there lives a singularly spectacular organism. Individuals have been spotted at elevations in excess of 20,000 feet, making this creature the highest living permanent resident on the face of the earth. The most amazing thing about this animal, in my opinion, is that it's not even warm blooded. No furry mammals or majestic birds can survive on those freezing slopes. 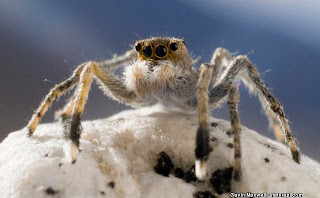 Instead, it is a lowly jumping spider that claims the title. Euophrys omnisuperstes, whose name means "standing above all." This tough little arthropod hunts crevices amongst the rocks, eagerly feeding on tiny animals that feed in turn on plant debris blown up from lower altitudes. Jumping spiders (Salticidae) have always impressed me, and this marvelous little guy is no exception. Truly, we live in a world that is full to overflowing with wonders. wow, all these years I thought it was the abominable snowman (lol)..